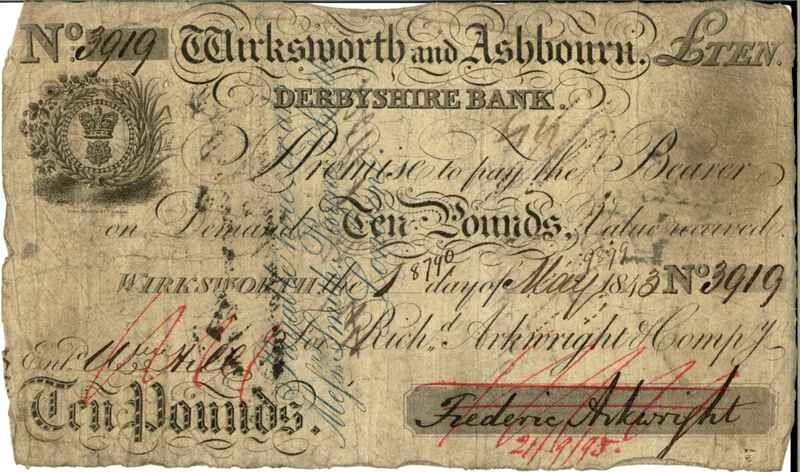 Buxton Museum and Art Gallery is now the proud owner of 6 Derbyshire banknotes dating from between 1813 – 1893. These compliment the bank note, copper printing plate and strike that Enlightenment! bought in 2010. We bought 2 lots with financial assistance from the V&A Purchase Grant Fund and 1 lot with assistance from the Friends of Buxton Museum and Art Gallery. We really appreciate this support! Thank you. 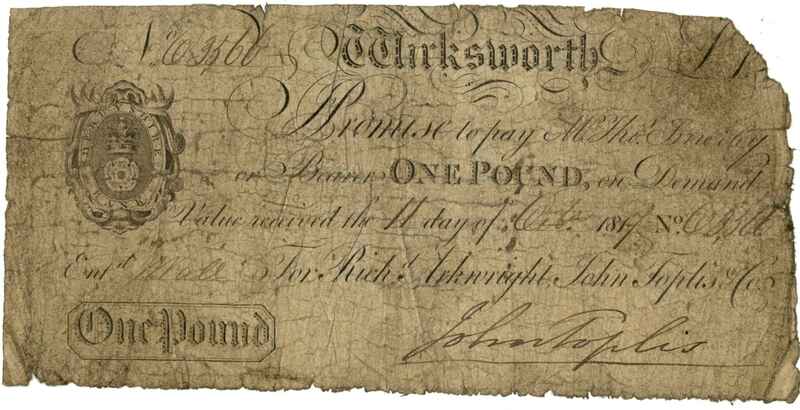 During the enlightenment period Derbyshire, like many other areas of England had an array of privately owned banks. Many of these banks issued their own bank notes, which were basically receipts for money deposited in the bank. The bank would then exchange the notes for real money when the depositor came to the bank. Over time the notes changed in their design and use, and instead of being issued to a specific named person they became anonymous and could be passed between people. Voila, this was the beginning of the notes becoming real money in their own right and not just an IOU for real money. (Yes, I realise that this is a very simplified, but it is Friday afternoon…. Anja Rohde is writing an article all about the banking industry in Derbyshire for the Enlightenment! catalogue which will give a more in-depth view). 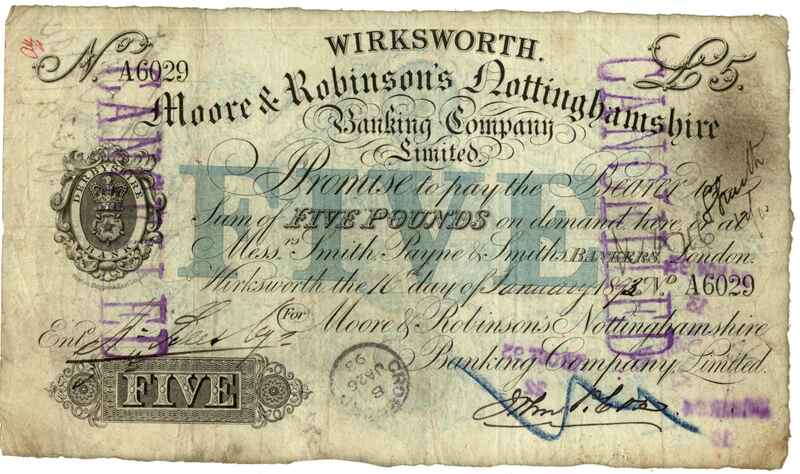 We bought the notes at the David Kirsch sale at Spinks in December, Kirsch’s private collection was described by Barnaby Faull from Spinks as “the best collection of English provincial banknotes by miles”. We had a 50% success rate, as we bids on 12 lots in total, below are the 6 we got. 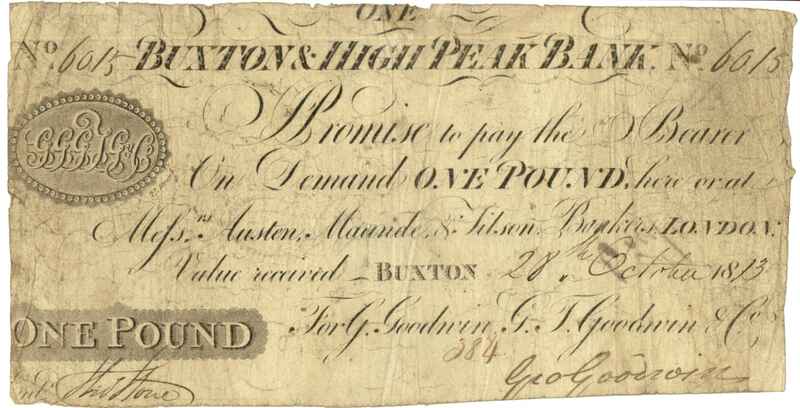 This note was bought with financial assistance from the Friends of Buxton Museum and Art Gallery. Thank you Friends for your continual support! This note is very similar to the note that would have been printed from the copper printing plate that we bought in 2010. There are just a few differences, the most notable being the detail of the ‘One Pound’ at the bottom left. We were really pleased to get this contemporary forgery. We don’t know what this stamp on the back of the note means. Any ideas are welcome! We bought this note and the one below with financial assistance from the V&A Purchase Grant Fund. Again a huge thanks to the V&A Purchase Grant Fund. We also bought two Derby and Derbyshire watermarked unprinted £50 notes, but the photo I have just looks like a white blur. I will try and get a better image and upload it. The stamp on the reverse of the 1840 Wirksworth and Ashbourne �5 forgery looks very much like a Inland Revenue Stamp Duty Office stamp denoting the payment of Stamp Duty. Brief online research shows that Stamp Duty was payable on bank notes unless the issuing bank was licensed to issue unstamped notes. However I wonder why there isn’t stamp duty impressed on the real note from the same bank? 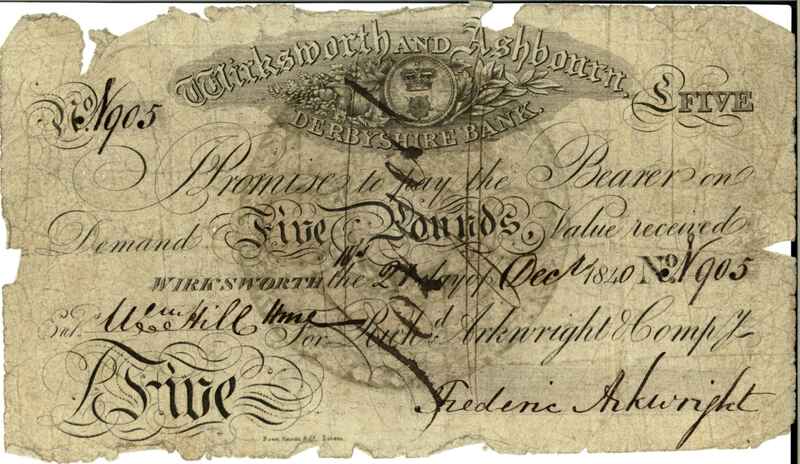 Maybe Wirksworth and Ashbourn (sic) Bank became licensed to issue unstamped notes between 1840 and 1843! Thank you – that explains the forgery. 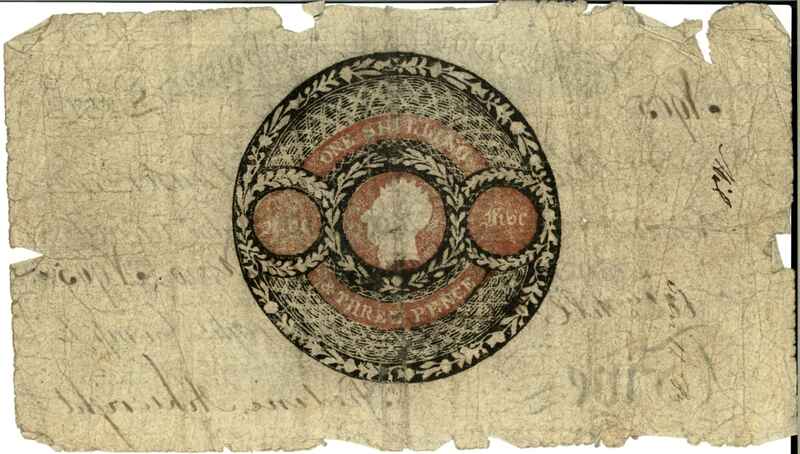 Curiously the auction catalogue entry for the real not (not the forgery) claims there is a revenue seal onthe reverse, but if it is there, I can’t see it! On the forgery the seal is definitely visible. Unless of course, the ‘revenue seal’ is also part of the forgery and in fact was not required. The real note does have a series of pin pricks around the crest, but they seem to be a random arrangement. I am sure we will get to the end of the puzzle. I have in my possession a couple of early Derbyshire Bank notes…Both in poor condition but may be of interest as they are from the Holt House Bank…issued Sept and Oct 1800.